If you drive in Waltham, stay informed about these major changes, pay attention to street signs and take it slow. Redesign of the Dangerous Totten Pond Road Intersection. Totten Pond Road, Lexington Street and Beacon Street will be redesigned. This was the top spot for car crashes in Waltham from 2011 to 2013. For the redesign, the City of Waltham acquired 380 Lexington Street, right in the middle of the intersection. Part of this lot will be used to expand the roadway. This is a major project. In addition to the land purchase, the roadwork is expected to cost $2 million. Carter Street. The city plans to redesign busy Carter Street, with a designated bus lane and possibly a “super crosswalk” to provide pedestrians more protection. This street is home to the Waltham MBTA commuter rail station. Motor vehicle traffic may be redirected on a one-way road and the commuter parking lot may become drop-off only. Cycling Infrastructure. Waltham has 12.5+ miles of on- and off-road bicycle facilities. These include eight miles of “sharrows” or shared lanes. Waltham plans to build more bike lanes and eventually wants to bring a bike share to the city. Check the City Website and Social Media. Pay attention to the city’s website and social media sites for updates (but please, not while you are driving). Get Information from Your Employer. If you work in Waltham, let your employer know you are interested in staying informed about projects that may impact your commute. Knowing about parking lot closures, road work and lane reductions in advance can reduce car accidents. Check Out the Master Plan. You can view the master plan on the City of Waltham’s website. Be prepared for Changes in Traffic Signs. Traffic signs, speed limit signs and traffic signals are your best direction on the roads. Drive slow and watch closely so you can make adjustments if needed. No Cell Phones, Distracted Driving. Put your cell phone aside and no texting while driving. 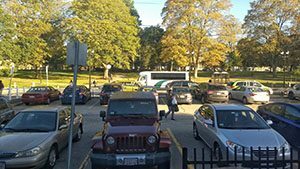 With so many changes happening in Waltham and school buses back on the roads, it is critical to give your full attention to driving. Car accidents can always happen, but you reduce your chances of being involved in an accident and being injured by paying close attention to the roads and what is happening in your community. If you have been injured in a car crash in Waltham, it is important to learn your rights. For a free legal consultation, contact the experienced Waltham car accident lawyers at Breakstone, White & Gluck at 800-379-1244 or 617-723-7676 or use our contact form. We represent those who have been injured by negligent drivers across Massachusetts, including in Waltham, Weston, Lexington and neighboring communities.